General Information: The Apricot (Prunus armeniaca, syn. Armeniaca vulgaris) is a fruit-bearing tree native to China. It is related to the Plum, and classified with it in the subgenus Prunus of the genus Prunus. In Europe, apricots were long considered an aphrodisiac, and is used in this context in William Shakespeare's A Midsummer Night's Dream, and as an inducer of labour, used in John Webster's The Duchess of Malfi for this purpose. Dreaming of apricots, in English folklore, is said to be good luck, though the Chinese believe the fruit is a symbol of cowardice. 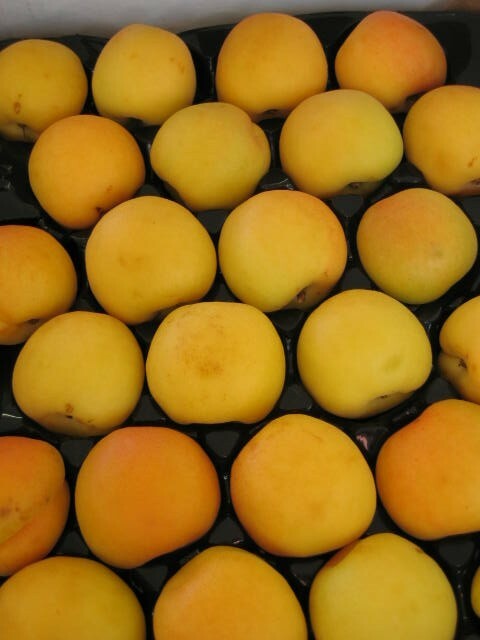 Nutritional: Apricots rank high in vitamins A (beta-carotene) and C, provide a good source of potassium, and contribute iron, calcium, phosphorus, and fiber to the diet. The bonus - they're low in fat, calories, and sodium. Applications: Apricots can be halved or sliced then frozen in syrup made from 2 cups sugar to 5 cups water; add 2 ounces ascorbic acid for each 2 1/2 cups syrup. Plunge the whole apricots into boiling water for about thirty seconds, and peel, pit and halve or slice. Apricots can be made into wine and brandy. They are one of the best natural sources of Vitamin A, especially when dried. Essential for healthy skin and mucous membranes. Vitamin A is also needed for good sight; insufficient amounts can cause night blindness, impair sight and increase susceptibility to colds and other illnesses. Although it is one of the few vitamins which we can theoretically build up to toxic levels, this doesn't normally happen if it is taken naturally. History: Apricots originally hailed from China. Cuttings of this golden fruit made their way across the Persian Empire to the Mediterranean where they flourished. The Spanish explorers get credit for introducing the apricot to the New World, and specifically to California, where they were planted in the gardens of Spanish missions. In 1792, in an area south of San Francisco, the first major production of apricots was recorded.